The Republican Party has reached a new low. Cleveland—For the first time (and hopefully the last time in my life), I felt a glimmer of admiration tonight for John Kasich. He may be an implacable foe of unions, an enemy of a woman’s right to control her own fertility, a Murdoch shill who never met a corporate tax break he didn’t like, a faithful bedfellow of the Koch brothers and the American Legislative Exchange Council with a long history of misdeeds in office, but having to actually watch Donald Trump become the Republican Party’s nominee for president was simply more than he could stomach. Compare him, for example, to Rick Perry, who only a year ago denounced Trump as “a cancer on conservatism,” but who has now apparently decided that the cancer had gone into remission. Still sporting the glasses Trump accused him of “wearing to make him seem smart,” Perry swallowed his pride, and his principles, for his moment in the convention spotlight. There were a few Republicans inside the Quicken Loans Arena who, for a brief moment on Monday afternoon, seemed prepared to consider the claims on conscience. As the party moved to approve the report of the Rules Committee—which on Thursday rejected an amendment to “unbind” state delegations, which might have allowed some pledged Trump delegates to withhold their support—delegations from 11 states and territories demanded a roll-call vote. At first Steve Womack, the Arkansas congressman presiding over the convention—House Speaker Paul Ryan was having his hair cut, and couldn’t make it—tried to simply rule against them. But as cries of “Roll-call vote!” rocked the arena, Womack abandoned the podium—and for 15 long minutes the Republican Party considered life without Trump. The prospect must have been terrifying, because when Womack returned he called a quick voice vote on approving the rules, declared, “The ayes have it” (which, in fairness, they probably did), and then announced that, of the 11 delegations demanding a roll call, only six remained—one short of the number required. 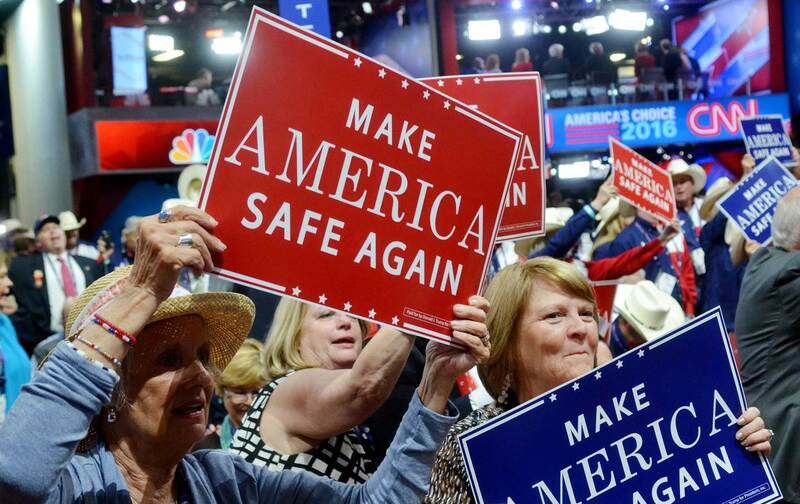 After this excitement, the convention returned to today’s chosen theme: making America “safe again.” During the rest of the evening, we heard not a discouraging word about George W. Bush’s failed “War on Terror,” or his disastrous destruction of Iraq. Nor—given Republican fealty to the National Rifle Association—were any of the speakers uncouth enough to mention the 30,000 Americans killed each year by gun violence. Instead, we heard from Patricia Smith, whose son Sean was killed during the 2012 attack on the US diplomatic compound in Benghazi. “I blame Hillary Clinton personally for the death of my son.” And we heard from Sabine Durden, Mary Ann Mendoza, and Jamiel Shaw, who each had a son killed by undocumented immigrants. You go to a political convention expecting a certain amount of cynicism. Even Bernie Sanders wasn’t above sometimes packing the riser behind his podium to suggest more diversity among his supporters than could actually be found at his events. So if, at times this evening, it seemed like there were more African Americans on the stage than on the convention floor, well, that’s television. But in its eagerness to parade and exploit these grief-stricken survivors, Trump’s Republican Party seemed to me to have reached a new low. How will it play in Middle America? If you knew the answer to that, you could probably call the whole election. Because alongside the naked appeals to fear and hatred and the desperate desire for someone—President Obama, Hillary Clinton, “illegal aliens”—to be punished, tonight also revealed the extent to which the Republican Party has seemingly abandoned that fight for the center, which is supposed to be the great prize of electoral politics. When I went to the South Carolina Tea Party Convention in Myrtle Beach in January, I heard some of the same grievances—including from a contingent promoting 13 Hours, the book purporting to tell the “inside story” of Benghazi. But back in January those people knew they were marginal—and had the anger that went with that. Tonight they brought their anger, resentment, and paranoia to prime time—and got a standing ovation from the party of Dwight Eisenhower and James Baker. We’ve got another three nights to go and, frankly, I’m not sure I’ll make it.